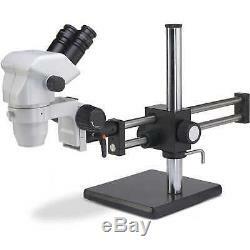 Accu-Scope Binocular Zoom Stereo Microscope with Ball Bearing Boom Stand. Features a ball bearing boom stand with a horizontal arm and a bonder port. Utilizing an advanced Greenough optical system, this zoom stereo microscope provides high-resolution, three-dimensional images with tremendous depth of field. The binocular viewing head is inclined 45° and rotates 360°. The eyepiece design offers comfort even during extended viewing periods and helps to maintain outstanding color reproduction. Ideal for industrial, OEM, and classroom applications, the stereo microscope features dual focusing knobs with adjustable tension control for rapid, easy focusing. Includes dust cover, eyeguards, and instruction manual. Our catalogs feature thousands of quality products for the forestry, environmental science, surveying/engineering, wildlife biology, horticulture, grounds maintenance, and education professionals - and more. 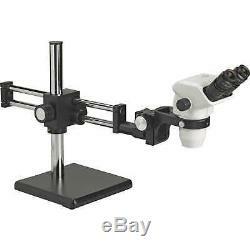 The item "Accu-Scope Binocular Zoom Stereo Microscope with Ball Bearing Boom Stand" is in sale since Friday, November 16, 2018. This item is in the category "Business & Industrial\Healthcare, Lab & Dental\Medical & Lab Equipment, Devices\Microscopes". The seller is "forestry-suppliers" and is located in Jackson, Mississippi. This item can be shipped to United States, Canada, United Kingdom, Denmark, Romania, Slovakia, Bulgaria, Czech republic, Finland, Hungary, Latvia, Lithuania, Malta, Estonia, Australia, Greece, Portugal, Cyprus, Slovenia, Japan, China, Sweden, South Korea, Indonesia, Taiwan, South africa, Thailand, Belgium, France, Hong Kong, Ireland, Netherlands, Poland, Spain, Italy, Germany, Austria, Bahamas, Israel, Mexico, New Zealand, Singapore, Switzerland, Norway, Saudi arabia, Ukraine, United arab emirates, Qatar, Kuwait, Bahrain, Croatia, Malaysia, Colombia, Panama, Jamaica, Barbados, Bangladesh, Bermuda, Brunei darussalam, Bolivia, Ecuador, Egypt, French guiana, Guernsey, Gibraltar, Guadeloupe, Iceland, Jersey, Jordan, Cambodia, Cayman islands, Liechtenstein, Sri lanka, Luxembourg, Monaco, Macao, Martinique, Maldives, Nicaragua, Oman, Peru, Pakistan, Paraguay, Reunion, Viet nam.